Brake rotors do not warp from heat, even when driven by the most aggressive traf­fic officer. Instead, they wear unevenly. This uneven wear is caused by the brake pads themselves as they intermittently touch an out-of-true rotor. The root cause of the uneven wear is one of two things: either the rotor was installed out-of-true with the hub, or the tire was improperly torqued to the hub during the last tire change. All of this is important for fleet managers because their vehicles have the tires removed frequently and the pads and rotors replaced frequently. You won’t solve a problem caused by wear if you treat it as a problem caused by heat. Instead, fix the rotor installation or wheel lug nut torquing. The problem of pedal vibration, incorrectly called rotor warp, occurs 3,000 to 5,000 miles after the brake or tire change. Because it is caused by uneven rotor wear, not the rotor warping like a potato chip from heat, you can’t solve this wear problem by better control of the heat, i.e., by the use of specially processed rotors or drilled and slotted rotors. Instead, you solve the wear problem by fixing the shortcuts in rotor installation or the improper lug nut tightening. By taking a few steps, the fleet manager can easily, quickly and permanently fix the pedal pulsation problem. First, for each rotor change, verify the runout of the rotor, and then do one or two quick things to have it less than 0.002 inch, which is the OE spec for most vehicles. Two, for each tire and wheel change or rotation, torque the lugs in a star pattern using either a torque wrench or torque stick. Those two steps will virtually eliminate premature rotor wear, period. Think about it this way: What are your conservative officers doing to their cars to “warp” the brake rotors in less than 5,000 miles? They don’t get the brakes warm (350 F), let alone patrol-hot (600 F), and never pursuit-hot (850 F). Yet their rotors are warping? No. They are not warping. They are unevenly wearing during the times of zero brake pedal pressure, and your officers are not doing anything to either prevent it or cause it. While a lot more was covered, that is the essence of the four-day Affinia-Raybestos Brake System Diagnosis & Repair Course, i.e., Foundation Brakes. This course is half classroom-based and half hands-on. It is held at Affinia-Raybestos headquarters in McHenry, IL and is also conducted at locations across the nation. Class sizes run a maximum of 12 because of all the hands-on work. The Foundation Brake class covers hydraulic braking theory, brake system dynamics, diagnostics, troubleshooting, repair techniques, preventative maintenance practices, rotor resurfacing techniques, bench and on-car lathe operation, brake (friction) pad materials and noise and dust solutions. The Foundation Brake class is not one bit product-oriented. It is not a veiled sales job. It is tech training, and you will get your hands dirty. You will install Raybestos pads, rotors and calipers in this class and Raybestos master cylinders, hoses, lines and valves in other classes. However, brand to brand comparisons are never made, and brand names are seldom mentioned. Instead, the brake tech school is all about brake jobs, accurate diagnosis, fixing it right the first time and preventing comebacks—not about what brand of pad or rotor is better than another. Police Fleet Managerattended the course and recommends it, without reservation, to all new police fleet managers, new maintenance techs, and as a refresher for veteran maintenance techs and new shop superintendents or maintenance supervisors. Just as important as the Foundation Brakes class is for many maintenance techs, so is the three-day Affinia-Raybestos ASE Brake Test Preparation Course. This course provides information, training and sample testing to help techs prepare for ASE Brake Test A5. Affinia-Raybestos also has shorter, stand-alone, hands-on brake lathe (both bench type and on-car), brake system diagnostics and installation, ABS advanced diagnosis and service, and a variety of chassis-suspension and steering courses. The brake foundations course started the way that all “real” training classes start: with a pre-test. What is the most effective way to pinpoint a spongy brake pedal? Perform an isolation test by clamping all of the brake line hoses. What type of seal is used around the piston in the caliper? A Square Cut Seal. A metering valve restricts initial pressure to where? The front brakes. A proportioning valve limits pressure under hard braking to where? The rear brakes. What is the probable cause for a car with a spongy pedal? Air in the system. Improper lug nut torque or tightening sequence causes rotors to “warp.” True. That last question is where the class instruction started. In the old days, star-pattern tightening using torque wrenches was the only way lug nuts were tightened. Not any more. Today, it is throw the tire and wheel over the lugs, hand start the five lug nuts, then use an air wrench in a once-around circle pattern, and you are done. Doing this, the first few wheel lugs lock the rotor into location while the last few wheel lugs pre-load the rotor, which is like slightly bending a spring. Even worse, even if perfectly tightened to 100 ft-lbs, the last few lugs are false readings. Some of the torque is absorbed in flexing the rotor, not tightening the lug. This is almost guaranteed to cause uneven rotor wear (incorrectly called warped rotors), which results in the tell-tale pedal pulsations after just a few thousand miles. The unevenly torqued rotor, even with the correct amount of torque, will not be bent when the rotor is cold. However, as the rotor heats up in normal use, it will expand unevenly. The most uneven area will, of course, be near the first tightened and last tightened lugs. As the rotor heats up and expands, a runout will be caused, i.e., a high spot on one side and a high spot on the other side. These high spots will come into intermittent contact with the retracted pads during normal driving, i.e., without brake pedal pressure. As this happens, the semi-metallic pad used with police cars will grind away the high spots on either side. On the other hand, the ceramic pad used with retail cars will transfer material to the high spots. In just a few thousand miles, the rotor will have a significant thickness variation, either from worn away rotor or material transfer from the pad. Rotor thickness variation causes brake pedal pulsation and steering wheel vibration! The wrong tightening sequence, even with the right amount of torque, can cause a rotor problem. So can the right tightening sequence with the wrong amount of torque. (No, your air impact wrenches are not calibrated!) Here is what happens. The air wrench increases or decreases in torque as it is being used. The line pressure falls, the air compressor kicks in, the line pressure increases. The result is that an air wrench nominally set at 100 ft-lbs may actually torque the lug nuts to 85, 110, 100, 90, 110, 90. Any variation above 10 percent is bad. The result is exactly the same in the situation where warming causes uneven expansion, as in the situation with the incorrect circular tightening sequence situation. These two causes of premature rotor wear can be easily fixed. First, use a star pattern instead of a circle pattern to tighten the lugs. Second, for those using a torque wrench, first pre-tighten the lugs with the socket wrench, then tighten them afterwards with the torque wrench. Don’t overdo it with the socket wrench. The torque wrench must be allowed to tighten the lug at least a little. If it clicks-out without tightening the nut at all, the nut could be way over-torqued. That is what happens if you use a breaker bar for the initial tightening. Third, for those using an air wrench, use torque sticks. Or set the air wrenches under the necessary torque and finish them off with a torque wrench. Rule one: star pattern. Rule two: torque sticks or torque wrench. Follow these rules every time you replace a tire. Properly tightening the lug nuts prevents one major cause of premature rotor wear. The other major cause is “improper” installation of the rotor. And here is where you may get some resistance from your veteran techs who have been doing brake jobs for 10 years. You cannot do a proper brake job without a dial indicator to measure rotor runout. Those who have turned a wrench before may think they already know how to properly change brake pads and rotors. This may be. However, if the brake job is performed on a modern two-piece hub and rotor the same way it was on the old one-piece hub and rotor, the job is probably not being done properly. That means the brake job is not being done per OE factory spec and how the OE dealers do it. This habit of “continuing to do it the old way” may explain why rotors produce a pedal pulsation, i.e., “warped” rotors in just a few thousand miles. That alone may explain premature pad wear and premature rotor wear, even in premature for police operations. “A brake repair shop without a dial indicator is like an engine rebuild shop without a torque wrench,” said Dann Ingebritson, technical instructor, Affinia Under Vehicle Group. The rotor lateral runout is a slight wobble or slight wave in the surface of the rotor as it is being rotated. This out-of-true condition can be caused by an out-of-parallel condition of the rotor—even a brand new one or one that just came off the bench lathe. This can also be caused by an out-of-parallel hub mounting surface or by a stack up of out-of-true conditions on both the rotor and hub. This runout or wobble will cause exactly the same intermittent contact between the rotor and the pad as the improperly torqued lug nuts. Again, material will be removed from the rotor by semi-met pads, or added to the rotor by ceramic pads in just the high spots. Again, the result is rotor thickness variation which causes brake pedal pulsation and steering wheel vibration. Again, the rotors need replacement in less than 5,000 miles. Again, the officer driving the car does nothing to cause the problem. When the new or cut rotor is put back on, torque it in place. Clamp a flex-arm dial indicator on a solid part of the suspension, place the indicator tip on the rotor, zero the dial and slowly rotate the rotor. A rotor runout gauge set costs about $50 and is available at any auto parts store or online. Google the term “rotor runout dial indicator” and you will find many. Check the OE spec, but most police sedans call for a maximum runout of 0.002 inch. If the runout is less than that, put the caliper and tire on! If you have cleaned the hub with a wire brush or roto-brush, including the surface very close to the lugs, and you are using a new high quality rotor, the majority of the time the runout will be in-spec. If the hub surface is not perfectly clean, if you bought a cheap rotor or if the rotor has been cut on a lathe with an excessive runout, the rotor runout will be out-of-spec. Mark the high spot. Something must be done or this rotor will cause pedal pulsation in just a few thousand miles. If the rotor is indicating an excessive amount of lateral runout, the tech has three options. One is a quick and easy option which works about 80 percent of the time, one is a fairly easy but more expensive option that works 95 percent of the time, and one is a slower and harder option that absolutely works every time. The easy solution is to take the rotor off the hub, rotate it about half way around and bolt it back in place. (On the 5-lug police cars, rotate it not quite 180 degrees, one way or the other.) Now indicate the rotor. Most of the time it will now be in-spec. Why? The rotor surface has a slight runout and, separately, the hub surface has a slight runout. When you bolt the rotor to the hub, you stack these tolerances. Let’s assume the rotor is out by 0.003 inch and the hub is out by 0.002 inch. Mounted with the high spot of the rotor on top of the higher spot on the hub, the assembly will have a runout of 0.005 inch, which is terrible. Now rotate the rotor on the lug pattern, i.e., “index” the high spot of the rotor over a low spot on the hub, and the runout is just 0.001 inch, which is excellent. Indexing the rotor works most of the time. It only takes a few minutes to remove the rotor, rotate it, replace it and indicate it. You may think, “Hey, that’s not in my flat rate.” Actually, it probably is. The fairly easy option that works almost all the time involves the use of Brake Align™correction plates, AKA shims or spacers. Again, indicate the mounted rotor and mark the high spot on the rotor. Also, mark the lug, or the two closest lugs, nearest the high spot. Remove the rotor and put the correct shim over the wheel lugs. Put the notch in the correction plate closest to the marked lugs. The notch marks the thinnest part of the shim. Put the rotor back on, just how it came off, and indicate it. It will be in-spec. The Brake Align shims come in a wide assortment of thicknesses, in 0.001-inch increments or so to make correction for a variety of runout conditions. If you need a 0.009-inch shim, start replacing parts rather than shimming them. The Brake Align shims are a bit expensive at about $20 each. That is a pretty costly solution to an out-of-spec rotor. Cut the rotor on a lathe or send it back to Cheap ‘R’ Us auto parts store where it came from. However, what if the high quality rotor is perfect? What if the excessive runout is in the hub? The Brake Align shim is certainly less expensive than a new hub. This entry was posted in Uncategorized on January 31, 2019 by cdr. WHAT DOES IT MEAN IF MY ROTORS ARE WARPED? Your rotors are those round discs you might be able to see through the spaces in your rim. When you hit the brake, the brake pads clamp the rotor to bring your vehicle to a stop. Rotors are supposed to be flat and smooth, but a number of factors can cause warping and compromise your vehicle’s ability to brake. Note: If your shocks are not performing as designed, they can also be the root cause of rotor warping as excessive weight shifts to the front design braking. Brake squeal: Nobody likes it. That high-pitched sound burrows into your brain stem, making you seriously consider crashing into the stopped car ahead rather than stepping on the brakes again. But it's not always a sign that something is wrong, as Porsche would like politely remind everyone with a new video dispelling a few myths on the automotive world's least favorite noise. We love these kinds of official explainer videos for the subtext, which is that the company appears to be sick of owners complaining that their six-figure sports car sounds like a junkyard-special jalopy as they ease up to a stoplight. Their gripes are understandable, if misguided. Consider the fact that the silent brakes found on most cars are minor engineering marvels—we're talking about stopping a two-ton metal missile with pure friction. Now think about the high-performance demands on braking systems in cars like the Porsche 911 GT2 RS. The video delves into the various sources of brake noises in a perfectly functional system; that is, we're not talking mechanical problems here. Even with the most expensive designs and materials, pressing a pad against a metal disc spinning extremely fast can cause tiny vibrations that turn the rotor into a speaker broadcasting the squeal to everyone. That's doubly true in bigger, stronger brakes with larger surface areas, which leave more room for extremely small variations in pressure along the pad's contact patch. Additionally, the advanced materials (think carbon ceramics) used in high-performance applications are often designed with stopping power first and noise reduction second. Porsche wants you to know they try very hard to mitigate that with some engineering trickery, and there are methods you yourself can try at home to cut down on the noise, but the video closes by noting that "some squealing is inevitable." So yes, it may not be the best look as you pull into your driveway in your new Porsche and shatter every window in the neighborhood. But don't worry—everything's working exactly as intended. Are there mice in my brakes?! They keep squeaking! Are your new Audi brakes squeaking? Brake noise in a brand new Audi is a fairly common issue. Audi uses high performance brakes which are semi-metallic. The metal particles in the brake pads will cause squeaking when they rub against the metal brake rotors, which is normal. Also, normal brake function causes brake dust to accumulate which can lead to squeaking. A quick way to resolve either issue is to stop. Stop hard! Test out those high performance brakes. Have a little bit of fun, just be sure to watch out for people behind you. This should quiet those brakes for you. Regular wear will eventually do the same trick. As the Audi Certified Technician says, one or so hard brakes a day keep the technicians away! This can be caused by brake dust, which is a combination of brake pad residue, dirt, and chemicals from the road (like the mag-chloride we Colorado drivers are so familiar with). Our Certified Audi Service Advisors can verify this on the service drive and ensure everything is okay. How long has the light been on? When the light comes on, it does not necessarily indicate that you need to come in immediately. You have anywhere from 500 to 1,500 miles once that light has come on to schedule an appointment. You will likely need your front or rear brake pads replaced, and possibly the rotors as well. This means you need to come in sooner rather than later – as soon as possible. Functioning brakes are extremely important for safety reasons and we want to make sure you get them fixed right away. If you do not feel that your brakes are operating as they should, strongly consider towing in the vehicle. It’s better to be safe than sorry. Has your Audi brake squeaking now become Audi brake grinding? The vehicle definitely needs to come in! Please call our customer care department to schedule a service appointment. Do I have to replace the rotors when I’m getting new brake pads? John Paul, AAA Northeast's Car Doctor, answers a question from a reader confused by a costlier-than-expected brake job. Q. I recently had my 2006 Honda Accord’s front brakes repaired at my local repair shop. I thought I just needed pads but was told that I needed pads and rotors. They told me that with the new type of brake pads, the rotors should also be replaced because they wear better together. I always follow the usage rule of 20,000 miles for pads, 40,000 miles for rotors, and 60,000 for calipers. My front brakes had about 18,000 miles usage for both the pads and rotors. Do you agree with what my shop told me about replacing the pads and rotors about every 20,000 miles? A. I believe in replacing parts when they’re worn out. There is no reason to think that if the brake rotors are in good condition they need to be replaced. Years ago, when brake rotors were worn, we resurfaced them. Now many rotors don’t allow for anything other than minor resurfacing. If the rotors were scored, out of round, or pitted, it would make sense to replace the pads and rotors together. All told, U.S. consumers bought 1.64 million new cars and light trucks in December, making the month the second-best for sales for the entire year. The seasonally adjusted annual rate (SAAR) of sales climbed to 17.72 million, its highest level of the year. Actual sales in 2018 totaled 17.33 million new cars and light trucks, the fourth-highest annual level ever. The U.S. automakers known as the Detroit Three posted mixed results. Ford Motor Co. (NYSE: F) reported December sales down 8.8% year over year and 2018 annual sales down 3.5% from a year ago. General Motors Co. (NYSE: GM) reported annual sales down 1.6% and December sales down 2.7% year over year. Fiat Chrysler Automobiles N.V. (NYSE: FCAU) posted a year-over-year gain in both December (14.0%) and for the full year (8.5%). The year-over-year percentage sales decline in December is higher than the annual decline for both Ford and GM. That suggests that the market for new vehicles is getting weaker. Annual passenger car sales have dropped from 43% of new vehicles sold in 2015 to 30% in 2018. For the Detroit automakers, passenger car sales accounted for less than 20% of 2018 sales. So what can investors expect from the Detroit Three going into 2019? Here’s a look at the numbers. Ford stock closed 2018 at $7.65 a share, in a 52-week range of $7.41 to $13.48. On the last trading day of the year, the consensus 12-month price target on the stock was $10.02, implying an upside of 31%. Adding in a dividend yield of 7.6%, Ford’s expected total return for 2019 comes in at 38.6%. Is that realistic for a stock that saw its share price drop by 38% in 2018? GM closed out 2018 with a share price of $33.45, in a 52-week range of $30.56 to $45.52. The 12-month price target was $45.09, implying upside of 34.8%. Including a dividend yield of 4.5%, GM’s expected total return for the year is 39.3%. But the stock dropped 18.4% in 2018. Fiat Chrysler closed 2018 with a share price of $14.46. Like the other automakers, it was closer to the bottom of its 52-week range of $14.06 to $24.95 than to the top. The price target on the stock is a whopping $25.43, which implies upside of 76%. The company does not pay a dividend. FCA’s share price dropped 18.9% in 2018. Looking at economic conditions and forecasts for 2019 leaves plenty of room for doubt that the Detroit Three’s price targets are going to last much longer. The new vehicle sales projection for 2019 is considerably weaker than 2018’s final figures. According to Automotive News, actual sales are forecast in a range of 16.8 million to 17.0 million new vehicles sold. Sales have topped 17 million every year since 2014. New vehicle prices rose by about 3% last year to average more than $36,000. Higher interest rates for auto loans and swelling inventories of used vehicles also don’t help automakers in 2019. On the plus side, demand for light trucks remains strong, more Americans are working, economic growth continues although the pace of growth is slowing, and gasoline prices have been very low, although that too may be reversing sooner rather than later. On balance, new vehicle sales face more headwinds than tailwinds for 2019. The question investors need to answer is whether these stocks are undervalued. It doesn’t look like it from here. The report provides a unique tool for evaluating the Market, highlighting opportunities, and supporting strategic and tactical decision-making. This report recognizes that in this rapidly-evolving and competitive environment, up-to-date marketing information is essential to monitor performance and make critical decisions for growth and profitability. It provides information on trends and developments, and focuses on markets capacities and on the changing structure of the Automotive Brake Systems. The Global Automotive Brake Systems market size was million US$ and it is expected to reach million US$ by the end of 2025, with a CAGR of during 2018-2025. Current advancements in automotive technology and developments in aerodynamic design have enabled us to utilize engine power efficiently and helped us achieve more speeds. Driving automobiles at high speeds demands effective vehicle stability. Automobile manufacturers have largely focused on the development of vehicles that are fast and safe. Brakes have become an important and crucial part of any vehicle to ensure safety, which becomes highly essential when the demand for speed is increasing consistently. An automotive brake system is commonly employed in different automobiles. It includes a brake device comprising different components such as brake pads, brake shoes, brake drum, rotor, piston, caliper, master cylinder, and brake booster, which are utilized for decelerating a vehicle. Chapter 13, 14 and 15, to describe Automotive Brake Systems sales channel, distributors, traders, dealers, Research Findings and Conclusion, appendix and data source. The global automotive brake system market can be segmented based on product, operation, technology, vehicle, and region. In terms of product, the automotive brake system market can be divided into disk brake and drum brake. 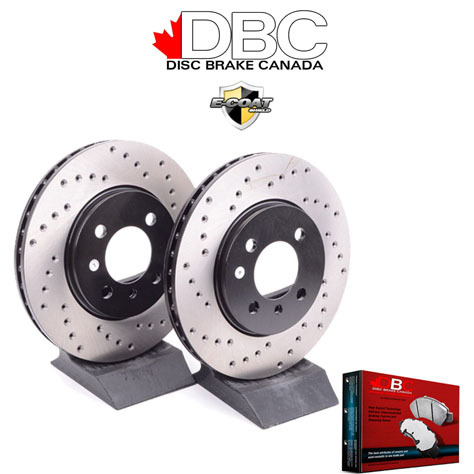 The disk brake segment is estimated to expand significantly during the forecast period due to the efficient and quick response of disc brakes than drum brakes. Based on operation, the automotive brake system market can be classified into electronics, hydraulic, flywheel, and spring. In terms of value, the electronics segment is likely to hold a major share of the automotive brake system market in the near future. The report will make detailed analysis mainly on the development environment, Market size, development trends, operation situation and future development trends of Automotive Brake Systems Market on the basis of current situation of the industry in 2018 so as to make full comprehension and judgment on the competitive situation of Automotive Brake Systems Market Carrier and assist manufacturers and investment organization to better grasp the development course of Automotive Brake Systems Market. The 360-degree Automotive Brake Systems overview based on a global and regional level. Global Automotive Brake Systems Market share assessments for the regional and country level segments. Global Automotive Brake Systems Market share analysis of the top industry players. Strategic recommendations for the new entrants in Global Automotive Brake Systems market. Global Automotive Brake Systems Market forecasts for a minimum of 9 years of all the mentioned segments, sub segments and the regional Global Automotive Brake Systems markets. Global Automotive Brake Systems Market Trends (Drivers, Constraints, Opportunities, Threats, Challenges, Investment Opportunities, and recommendations). Many carmakers have softened their stances on driverless technology because they’re not sure if the tech is quite ready for the mainstream. Financial Times reported that the mood about driverless cars has been noticeably different at this year’s Consumer Electronics Show (CES) in Las Vegas, and that some companies that had previously touted the technology seem less eager to make the transition. For example, as recently as two years ago, Audi was pushing the launch of its first car that would take full control away from the driver, only asking for assistance when the car ran into a problem that was too complex for it to handle. This level of autonomy is known as Level 3. A fully autonomous vehicle would be a level 5, the highest level. The problem is that regulators are worried about the legality of such a system, because the nuances of whether it can work in an emergency are questionable. Consequently, Audi has never used the software in the U.S.
Part of the concern is whether a driver will be ready to take the wheel at a moment’s notice when the car requests it, and also the question of who will be responsible if something goes wrong. Major car manufacturers like Ford, Toyota and Volvo say they’re skeptical about Level 3 tech, and say it’s safer to wait for better technology that wouldn’t require human intervention. Now, carmakers are shifting to less exciting terrain: the education and regulation of the new technology. Instead of bragging about shiny new driverless cars, Audi unveiled that it was one of several carmakers that were part of a new industry group called Pave. The aim of the group is to bring concrete advances to road safety by educating policymakers about how the “technical challenges of creating driverless vehicles are solvable,” according to Audi’s North American President of Operations Mark Del Rosso. SODEGAURA, Japan — What makes a Toyota Supra a Toyota Supra? Ask the legendary car's chief engineer, and he will say it has more to do with the type of engine than who actually makes it. That's the main reason Japan's biggest automaker decided to put a German-designed powerplant from BMW instead of one of its own into the reboot of its signature sports car. The fifth-generation Supra that debuts at the Detroit auto show next month will get an inline, six-cylinder engine, he says, because the model's identity depends on it. Every previous Supra generation had an inline-six. Customers expect nothing less in the next, Tada says. Which is a problem: Toyota doesn't make the straight-sixers any more. Instead, Toyota is using the same 3.0-liter six-cylinder turbo that goes into the BMW Z4 roadster. It generates more than 300 hp, Tada said, though Toyota hasn't specified exact figures yet. Customer surveys showed that the Supra's one non-negotiable attribute was a straight six. "The straight six is the only engine with perfect balance and low vibration. 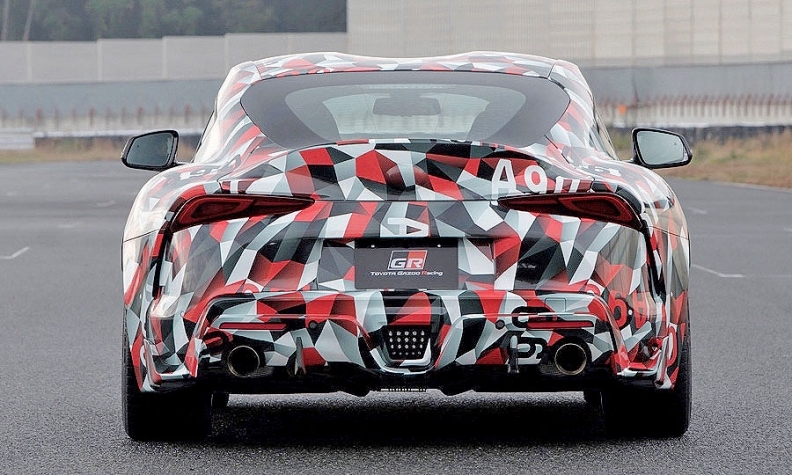 We can realize smooth driving with exciting sound," Tada said during a recent Supra test drive at a racetrack southeast of Tokyo. The engine is newly developed for the BMW 3 series, Z4 and Supra, using several new technologies to improve power and emissions, Tada said. It passes strict Euro 6 emissions rules. But the Supra draws on more from BMW than an engine. The car also shares the Z4's automatic 8-speed transmission, chassis, platform and many mechanical components. The two cars were developed together by the German-Japanese duo under a 2012 agreement. Toyota also tuned the engine, transmission and chassis to its own tastes. That job fell to chief test driver Herwig Daenens. The Belgian driver studied at the hand of late master test driver Hiromu Naruse, the Toyota guru who taught CEO Akio Toyoda how to race and set the standard for the company's sports cars by helping craft the Lexus LFA super sports car. Toyoda also had a voice in the tuning. 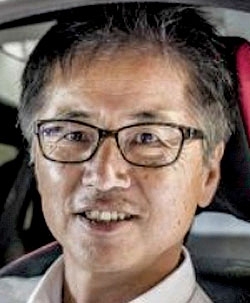 He tested the car repeatedly during development, as early as three years ago in Germany, offering input on areas such as braking, Tada said. "It was only recently that he started smiling a little, and said 'it has become better,' " Tada said. Supra fans may get a sneak peek before the Detroit show. 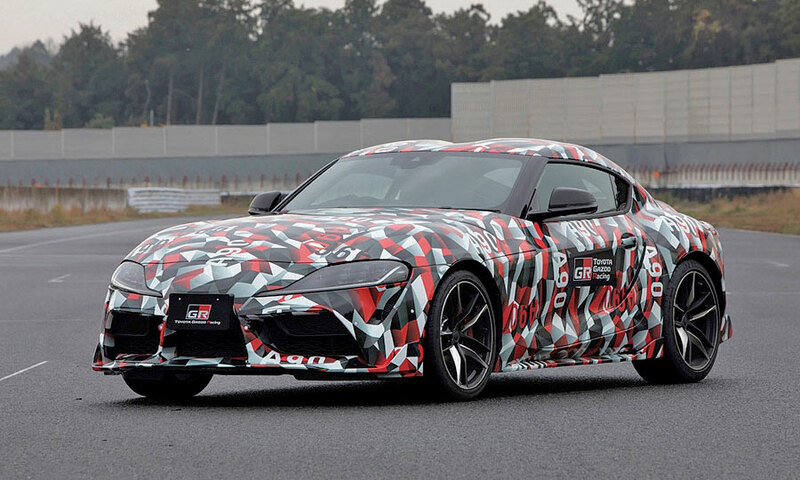 Toyota's Gazoo Racing division will show a GR Supra Super GT Concept at the Tokyo Auto Salon, which runs Jan. 11-13. A teaser shot of that car shows a blacked-out Supra with a large racing wing on the back lid. The Supra is the first original product developed by Gazoo Racing Co., which was cleaved off last year as an internal subcompany in a reorganization to streamline operations. Despite Toyota's sporty ambitions, the brand's two sporty offerings still rely on engines that aren't even made by Toyota. The Supra gets its from BMW. The other, the Toyota 86, gets its four-cylinder horizontally-opposed powerplant from partner Subaru, which also assembles the car. But Toyota might not have to borrow from others for long. Tada, who is chief engineer at Gazoo Racing, said the division is currently developing several of its own sporty engines for production cars. Tada declined to give further details, such as whether the engines are all-new powerplants or simply retuned versions of existing ones. But he suggested electrification might play into the plans. The revived Supra gets a low center of gravity, wide track and short wheelbase for crisp handling, Toyota says. It also boasts a 50-50 front-rear weight ratio and body rigidity on par with the carbon-fiber LFA. The car is code-named the A90, following on the previous A50-A80s. 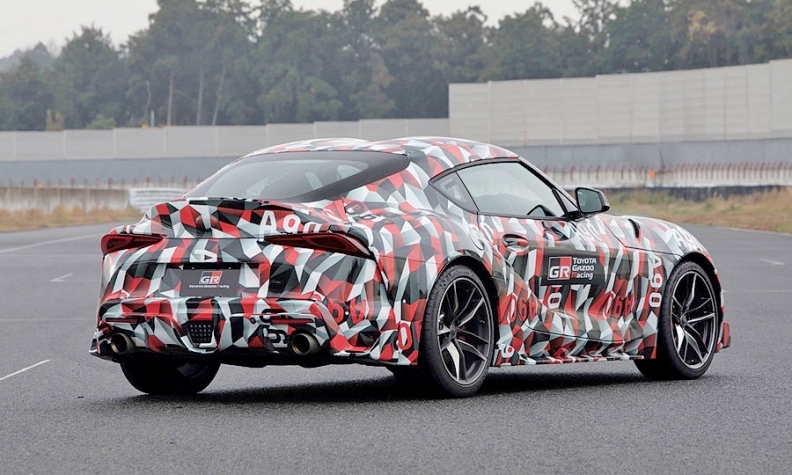 Among other details released by Toyota, the Supra will get four adaptive dampers as standard equipment. The system automatically lowers the car 7 millimeters (a quarter inch) as needed for better handling and grip while cornering. It also gets an electronically actuated active differential. The setup sends power to either rear wheel as needed for better traction. Finally, the Supra rides on stiffer wheel bearings for increased rigidity and large-diameter disc brakes with robust four-pot Brembo calipers. "We focused on making this car as small as possible. It comes in a small package, and the driver can always feel the corners of the four tires," Tada said. "That, in turn, determined the width of the car, which made it impossible for us to create the rear seat. So we have created a two-seater car despite opposition from our sales department." Toyota pulled the last Supra from North America in 1998, but the car remained in production for other markets until 2002. Toyota has struggled with sporty coupes ever since. The last generation Supra model offered a twin-turbo six that gave near supercar performance of 0-to-60 mph times under 5 seconds and a top speed of more than 150 mph. That car was also pricey, selling for more than $50,000 in 1996.